My Ideal Day… Yoga, Buckwheat Pancakes, Green Smoothies and More!!! Today started out by going to Yoga… there is a lovely yoga studio in town called Cannon Beach Yoga Arts. You can check out their schedule here. Anyway I took a Vinyasa yoga class to start off my day. All I had before class was some peppermint tea to help me hydrate and detox (ie. sweat more) in the class. In Chinese Medicine we use peppermint to release the exterior and it is slightly cooling in nature. Releasing the exterior typically means promote sweating, but it is also helpful in the first stages of a cold or flu. Western herbalism uses peppermint in a different way; to regulate peristalsis in the intestines and soothe an upset stomach. The essential oil is also helpful for headaches and clearing the sinuses too. Okay enough on the properties of peppermint. Here is how my day was ideal… tea, yoga, and then on my bicycle ride back home it was slightly cool so I wanted something warm for breakfast. 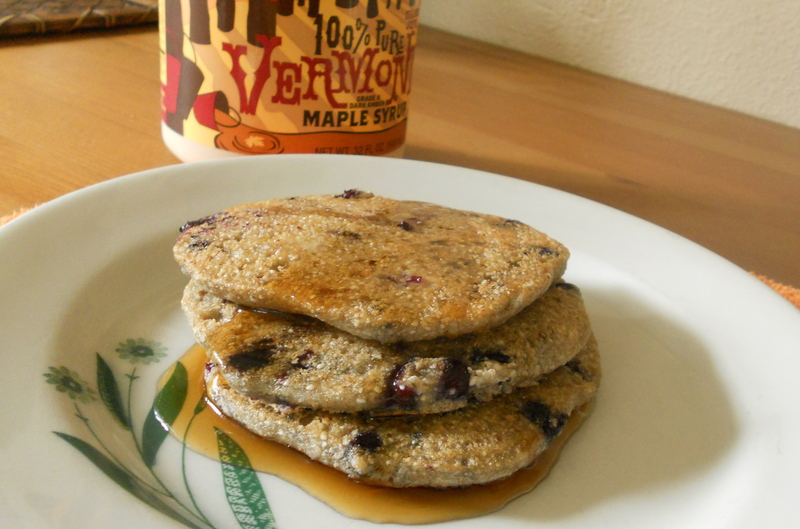 We had just gone to Bob’s Red Mill in Portland and had a ton of raw buckwheat, so I decided on buckwheat pancakes. We had the buckwheat in it’s whole form, so I blended it up dry in the vitamix for only 10-20 seconds and used the flour/meal to make delicious blueberry pancakes. After enjoying the pancakes I made a green smoothie and off to work I went. The pancake recipe is a small one so you may want to double it. Mix dry ingredients first and then mix in wet. The consistency you are looking for is like a runny oatmeal. Start with adding just a little water and then slowly add just enough for the right consistency. Use a large pan or skillet on medium heat and put some coconut oil in the pan to coat the bottom. Coconut can tolerate medium to high heat so it’s great for making pancakes. Flip the cakes when one side is browned to your liking and enjoy!!! I love maple syrup and sometimes I will take a small pan and heat up the blueberries and a little maple syrup to make blueberry syrup and it’s delicious! Place all ingredients in blender and add 1-2 cups of water, just enough to blend to a uniform consistency. 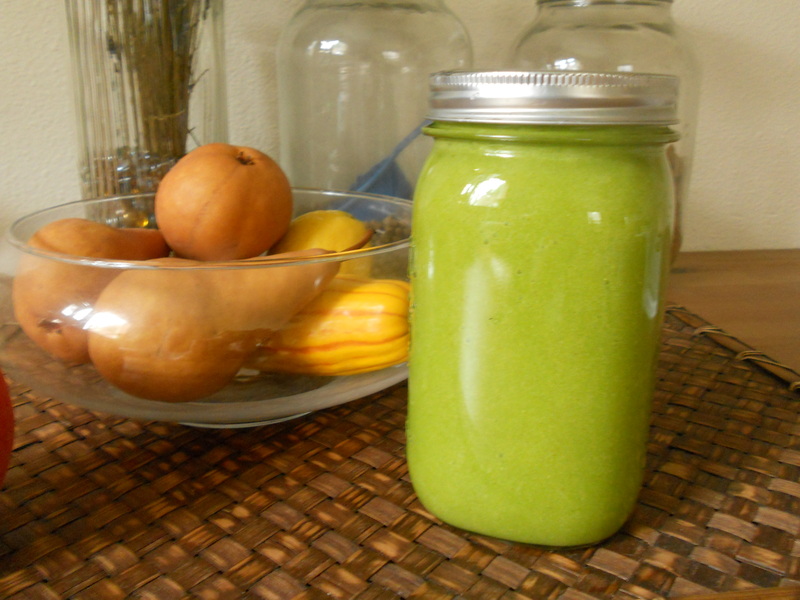 This is my favorite smoothie to date since it tastes so much like pear, and I LOVE pears!!! It made 6 cups of smoothie, enough to have a couple cups in the morning and take a big jar to work for my lunch. After work I am going to make my favorite meal ever!!! Portobello mushroom steaks, yams, and greens… recipe to be posted soon.